The event brought together clergy and lay leaders from four mainline denominations to train a team of coaches that will walk alongside congregational leadership in the final phase of Hope Partnership’s transformation services. Coaching Academy is the second training event held by Hope Partnership under the groundbreaking ecumenical collaboration announced earlier this year by the Presbyterian Church (U.S.A.) extension fund and three other mainline Protestant denominations: Episcopal Church, the United Church of Christ, and Christian Church (Disciples of Christ). The collaboration brings together the extension funds’ network of experts, decades of experiences, and the best of their programs and services to support congregations undergoing transformative visioning processes. 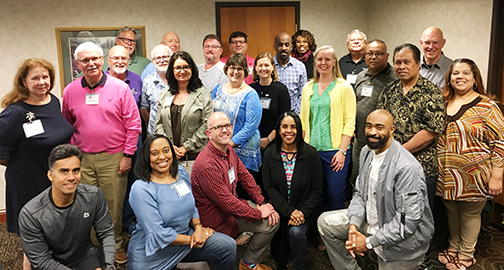 The collaboration developed over several years, as extension fund leaders realized they had a shared vision to better support struggling churches. It provides congregations with an expanded portfolio of products and services, including leadership coaching, demographic research, and comprehensive transformation services. Kedron Nicholson, Coaching Academy participant and Episcopal priest, knows what it is like to be in a local church and need help. Hope Partnership’s approach respects the uniqueness of every congregation – and denomination – and builds on assets within a specific context. The newly expanded network of trained facilitators and coaches includes clergy and lay leaders from each of the four participating denominations. “Coaching allows me to reach beyond my local ministry setting and do life-giving ministry for my whole Church,” says Steven Smith, pastor of United Disciples of Christ Church in Charleston, W.V. Smith has worked as a ministry coach for new church planters and transformational leaders since 2004. For a full list of trained Hope Partnership assessors, facilitators and coaches by denomination, visit: http://www.hopepmt.org/meet-our-facilitators-and-assessors/ .